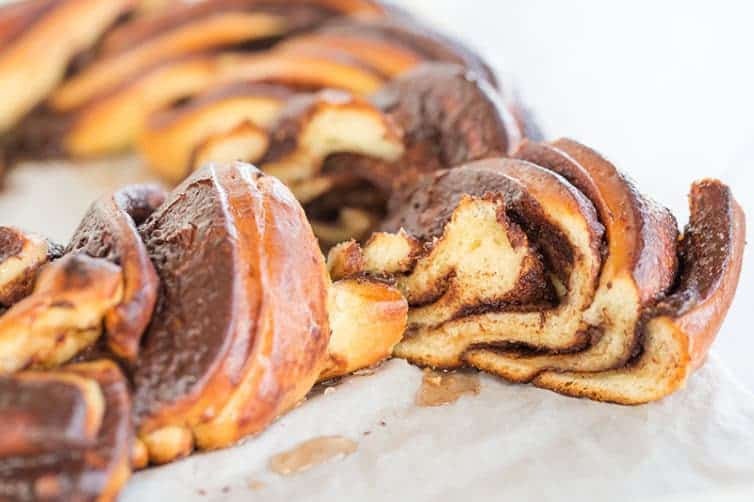 A rich brioche dough, a fabulous chocolate filling, braided and shaped into a wreath for the most decadent holiday breakfast! 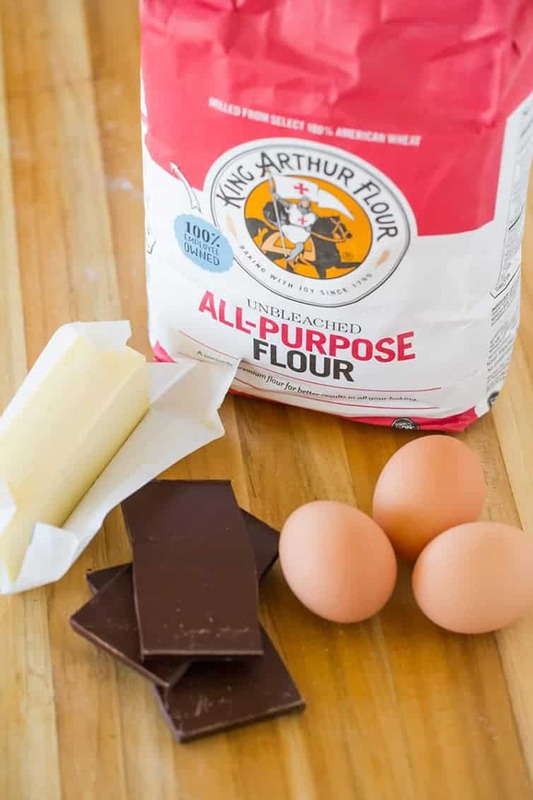 This recipe is sponsored by King Arthur Flour. I would like to introduce you to the most amazing thing to come out of my kitchen in months and months. Sure, I’ve made some good things during that time span, but nothing even comes close to the magic that is this chocolate babka recipe. I first made a chocolate babka loaf a long, long time ago and while it was very good, it really didn’t tempt me to make it over and over again like this one has. 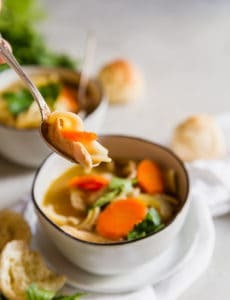 I’m already planning to make this recipe again before the holidays wrap up because it’s way too good not to share with everyone I know. 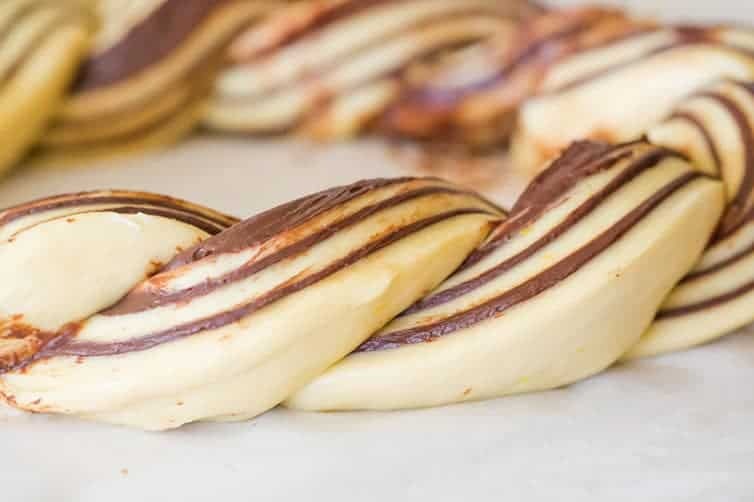 It’s a deceptively easy recipe and quite forgiving, which is awesome news if you’ve been wanting to enter the wondrous world of babka, but have been intimidated. 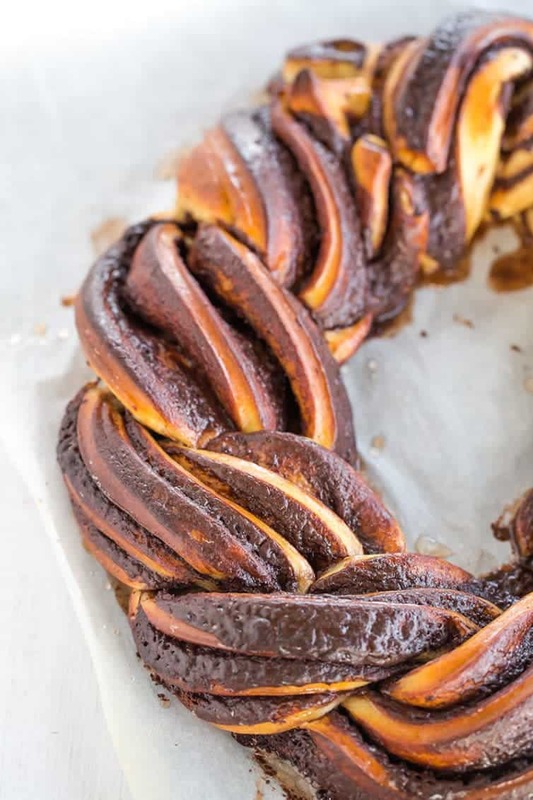 This is, hands-down, the only chocolate babka recipe you’ll ever need. I’ve had a particular holiday recipe on the brain for the last few weeks that I couldn’t shake… an old friend of mine’s grandmother used to make a lemon-flavored tea cake or soft biscotti (it’s been so long I can’t remember exactly), and it was studded with chocolate chips. I think I’ve mentioned before that I really do not like citrus flavors in my desserts, but the combination of lemon and chocolate, and the soft, sponge-like quality of the cookie/cake just worked so well together. I regret never getting the recipe, but this chocolate babka recipe has brought that wonderful flavor combo flooding back and it’s absolutely phenomenal. This babka starts with a rich brioche dough; if you’ve never made brioche, it’s loaded with eggs and butter, which makes for a dough that’s quite easy to work with. This is great news if you’re new to yeast baking or a little intimidated by babka (don’t be!). And then, the filling. Oh my, this filling. It’s a combination of dark chocolate, cocoa powder, butter and powdered sugar. 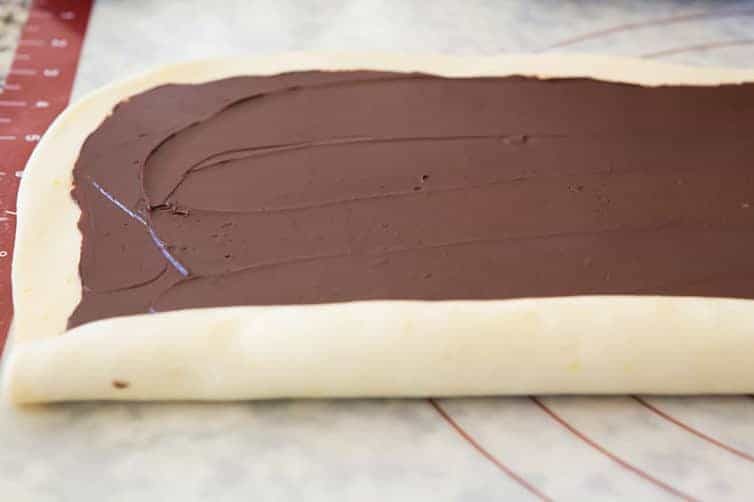 When it’s all mixed together and ready to be spread on the dough, it’s the consistency of ganache. I’d be lying if I told you I was able to restrain myself and not take a spoonful for myself before I started filling the dough. I was IN HEAVEN. While babkas are traditionally baked in loaf pans, I wanted to do something a little extra-special for the holiday, so once I split the log of dough, I braided it and shaped it into a wreath. Just as I’d suspected, it baked up beautifully with all those puffs of dough and swirls of chocolate. 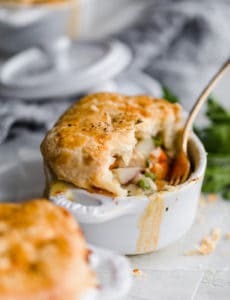 Not only does it make for a pretty presentation, but it gives it a little bit of a “pull-apart” characteristic, as well. 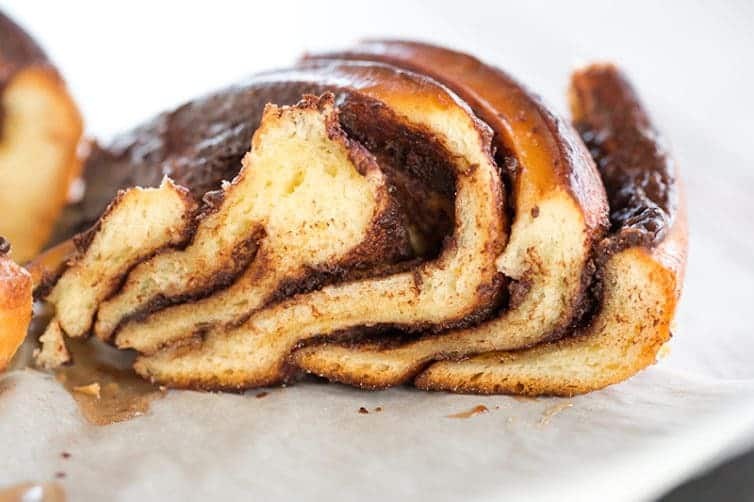 I could totally see sitting around the table on Christmas morning taking turns breaking off chunks of this chocolate babka while Christmas music plays and the floor is littered with wrapping paper. That just might need to become a tradition in our house! 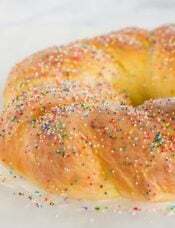 A rich brioche dough, a fabulous chocolate filling, split, braided and shaped into a wreath for the most decadent holiday breakfast! 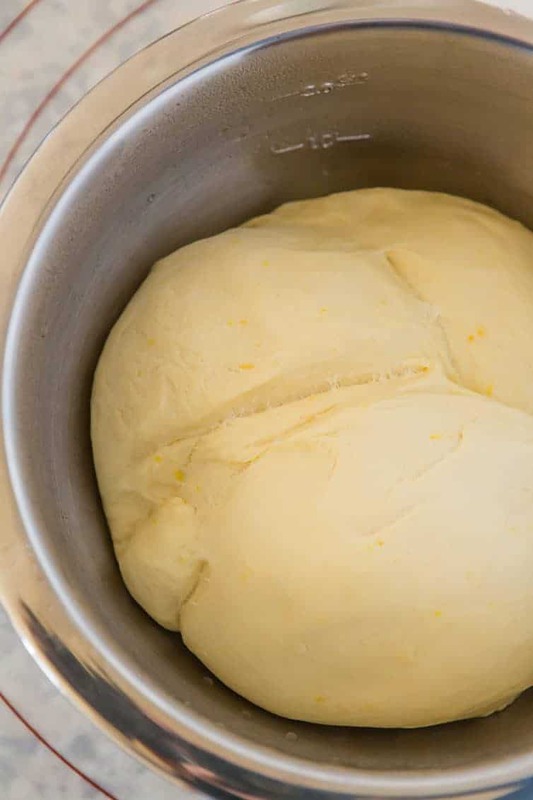 Make the Dough: In the bowl of a stand mixer fitted with a dough hook, use your fingers to rub together the sugar and lemon zest until all of the sugar is moistened. Add the flour and yeast and mix on low speed to combine, about 1 minute. Add the eggs and water and mix on low speed briefly, then increase to medium speed and mix for 5 minutes, until the dough comes together (it will appear very dry and shaggy at first, that's okay). Add the salt, then add the butter a few cubes at a time, mixing until it is completely incorporated into the dough. Continue mixing on medium speed for about 10 minutes, until the dough is completely smooth, elastic and shiny. Place the dough in a large greased bowl, turning to coat it, then cover with plastic wrap and refrigerate overnight. Assemble the Babka: Divide the dough into two equal pieces. Working with one piece at a time, roll the dough on a lightly floured surface into a 15 x 11-inch rectangle. 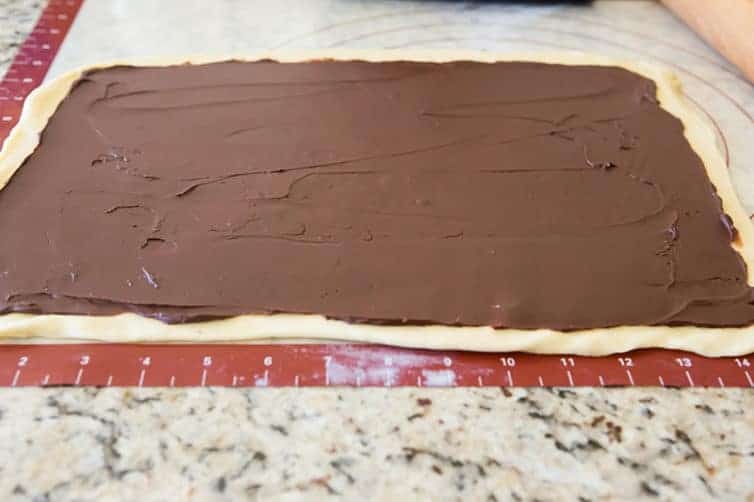 Use an offset spatula to spread half of the chocolate mixture over the dough, leaving a ½-inch border around the edges. Brush a little bit of water along the long edge of the rectangle farthest away from you. Use both hands to roll up the rectangle, starting from the long side that is closest to you. Press to seal the dampened end, then use both hands to even out the roll. Rest on its seam. Trim about ¾ inch off both ends of the roll with a serrated knife. Using the same knife, gently cut the roll in half lengthwise, starting at the top and finishing at the seam. With the cut sides facing up, gently alternate crossing the pieces over each other to create a braid. Repeat steps #4 and 5 with the second piece of dough and remaining chocolate filling. 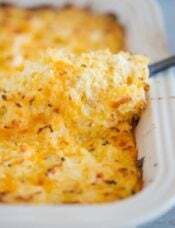 Line a large baking sheet with parchment paper. Gently transfer the two babka braids to the prepared pan and shape them into a circle, braiding together the ends for a continuous effect. Cover with a wet tea towel and allow to rise in a warm place for 1½ hours (the cake will not double in size, but will rise by about 20 percent). 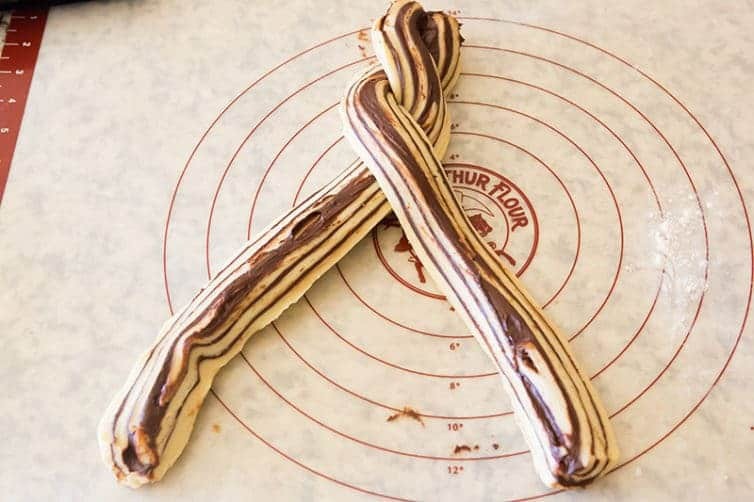 Preheat the oven to 375 degrees F. Remove the tea towel and bake the babka until a skewer inserted into the center of the dough comes out clean and all of the exposed chocolate swirls are firm to the touch, about 25 to 30 minutes. Make the Simple Syrup: While the babka is baking, make the simple syrup. Combine the water and sugar in a small saucepan and bring to a boil over medium heat. As soon as the sugar dissolves, remove from the heat and set aside. As soon as the babka comes out of the oven, brush all of the syrup evenly all over the babka (it will seem like a lot, but just keep brushing!). Slide the parchment paper from the baking pan to a wire cooling rack. Allow the babka to cool completely before serving. The babka can be wrapped in plastic wrap and stored at room temperature for up to 3 days, or wrapped in plastic wrap and foil and frozen for up to 1 month. Grease two 9x5-inch loaf pans and line the bottoms with parchment paper. Working with one half of the dough at a time, after slicing the log of dough lengthwise, place the two halves next to each other, cut sides up. Pinch the top ends together, then lift the right half over the left half. Repeat this, but this time lift the left half over the right. Gently pinch together the other ends. Transfer the shaped dough into one of the loaf pans. Repeat with the second half of the dough. Rise as directed above, then bake for 30 to 40 minutes, checking for doneness as directed above. Brush with the simple syrup as directed above, allow to cool for 30 minutes, then remove from the pans and place on a wire rack to cool completely before serving. Thank you to King Arthur Flour for partnering with us on this decadent chocolate babka! Just made this yesterday and it was super delicious! Everything went smoothly, and I was surprised how easy the chocolate filling was to work with compared to a previous babka I made in the past that used chopped up (unmelted) chocolate. I didn’t have time to refrigerate the dough overnight so I just left it on the counter for an hour to rise and reduced the second rise by half an hour (since the dough was already warm and not coming out of the fridge) and that worked well. Will definitely make again! I made the dough for this yesterday, and didn’t get around to making it today. 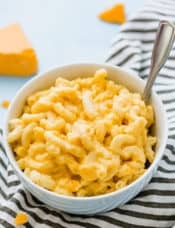 Is it possible to refrigerate for several days before continuing with the recipe? Or could I freeze the dough for later next week or would that ruin the consistancy? Would it rise properly? Hi Leah, I think you could keep the dough in the refrigerator for 36-48 hours. I have not tried to freeze this dough, so I couldn’t say for sure. Second time making this. Wonderful again. If you manage to reply before tomorrow, I would be so grateful. Hi Richard, No need to let it come to room temperature; you can start working with it straight from the fridge. Enjoy!! 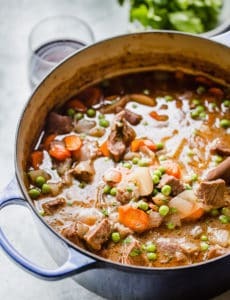 Can I substitute instant yeast for active? Hi Donna, This recipe does call for instant yeast, not active. All I had was active yeast on hand, not instant. I ended up taking the risk and trying active yeast and it turned out beautifully! But I did dissolve the active yeast in the 1/2 of water that the recipe called for before adding it into the other ingredients. Thank you for a tasty beautiful recipe! Hi – I made this today and after cutting each roll in half, th the chocolate was cracking. It didn’t have the smooth consistency you have in the picture. Do you think I overheated the chocolate? I followed the directions to put in the microwave for 30 second increments until smooth, so not sure where it went wrong. Hi Melissa, Hmmmm it could have overheated and seized, but that seems fairly unlikely. Was it completely smooth and spreadable when you spread it on the dough? I’m wondering if the powdered sugar wasn’t completely incorporated? 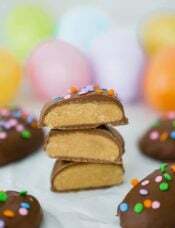 I was just wondering if I can substitute the eggs with something else like flax eggs? Hi Sarah, I’ve never tried to use an egg substitute, so I could not say for sure how it might affect the bread. Hi. This looks delicious, I just have a question. Can I make this without the refrigerating part? Can the dough rise at room temperature and for how long should I leave it? 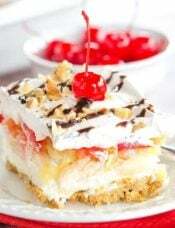 Hi Claudia, This does rely upon a longer slow rise in the refrigerator. It looks so great~~ I want to try it immediately! Thank you for sharing the recipe! I hope I see this chocolate wreath last Christmas. Love it. Definitely a hit. Thanks for the recipe it reminds me of Seinfeld. Hello! Love your blog. I tried out the dough last night and after 10 minutes it still wasn’t really coming into a ball but was more akin to a cookie dough texture (even after 10 minutes at level 6 on my kitchenaid)? I tried kneading it by hand afterwards for a couple minutes but it still wasn’t a smooth texture. I decided to let it sit in the fridge to rise just in case and it just didn’t really rise. I’ve double checked the ingredient list and it looks like I added everything when I should have, it just didn’t work for me. Any ideas where I messed up? Hi Diane, It definitely has a loose, more wet consistency after the butter is added, but after kneading on medium speed for 10 minutes it should definitely start to come together. I would try letting it go a little longer to see if it starts to come together. It won’t do a huge rise because of how enriched the dough is – it rises about 20% or so. I made this recipe last weekend and the dough didn’t rise. I followed all the instructions so I’m not sure what went wrong. It asked more doughy than brioche should. Did this ever happen to you? Any recommendations? Thank you! And by “asked” I meant “tasted”….autocorrect…. Hi Elizabeth, This dough won’t do the usual double-in-volume that most yeast doughs do because it’s so enriched. It will rise by about 20% or so. Mine definitely did not taste doughy, though. 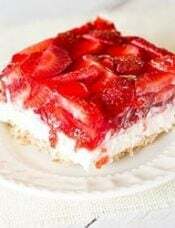 Do you think you can make this same recipe with jam in the middle instead of chocolate? Please do a video on how to do this I’ve never really naked and would love a video especially how to split the loaf and braid.thank you. I prepared the brioche last night and it’s into the fridge — it doesn’t seem to have risen too much. It’s maybe 10-20% bigger. I wonder if I did something wrong? I follows the directions very closely.. admittedly, I’m a little nervous about the rolling and braiding portion–hoping for the best! Hi Steph, Nope, it won’t raise too much, you are fine! Do I have to change anything if I am making this at high altitude? 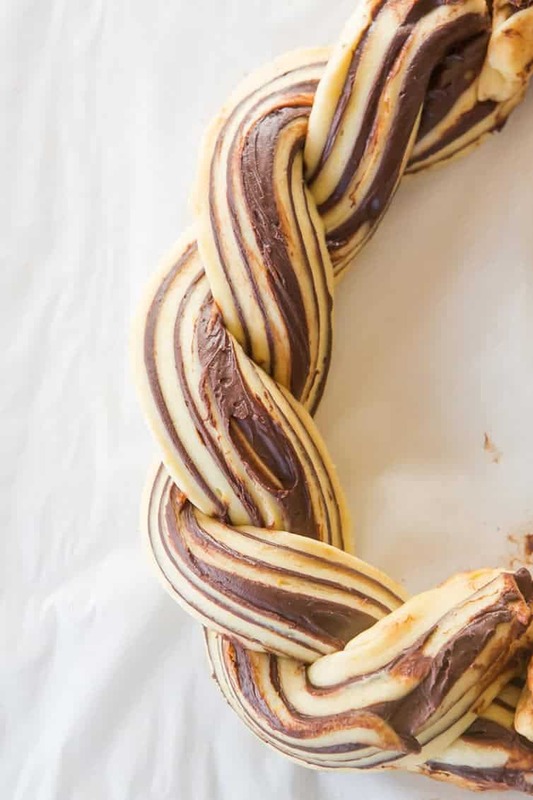 Wow, that chocolate babka wreath is a beauty! I love KAF. There products and recipe forums are great. What a beautiful twisted wreath! Wow, wow, wow! I love this! I will definitely be making it but maybe next year…all my holiday baking is already mapped out. Thanks for sharing! I bought active yeast, will this work as well and should i dissolve it in water first? Hi Maryann, I do not recommend active yeast in this recipe, since it does a cold rise in the refrigerator and it’s a very rich dough, it needs the boosting power of the instant yeast to give it some oomph. This is so unbelievably gorgeous. Can’t wait to try it when I have some free time on my hands. Hi Michelle- quick question: Does the water need to be a certain temperature as is typical in yeast dough?? I wasn’t sure if this one were different. Hi Angela, No the water doesn’t need to be a particular temperature since we’re using instant yeast. I’ve already shared this on Facebook and pinned it for next year. 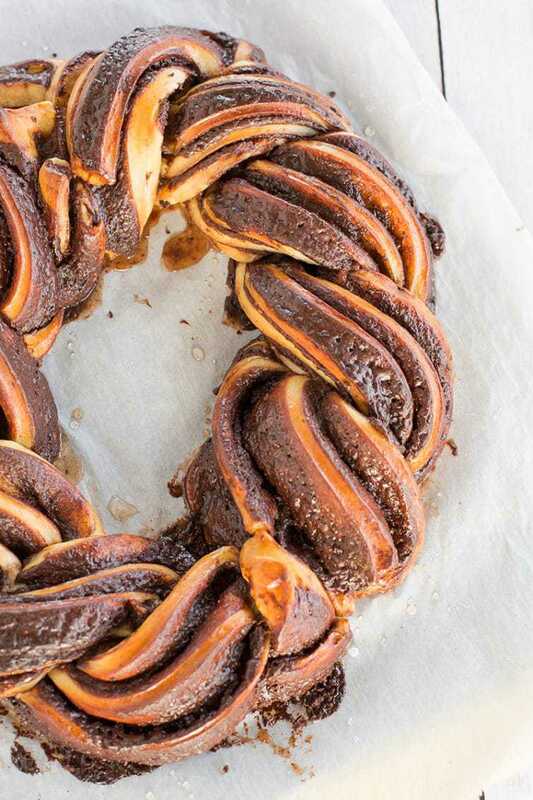 I love that you braided the babka — it looks so impressive. Thank you for the inspiration — Merry Christmas! Merry Christmas to you, Marisa! You are very encouraging about this recipe and I like the idea of a couple of these in my freezer. This looks unbelievable, no wonder you’ve made it multiple times!